Danny Boyle's Trance enters the canon of compromised memory movies like Memento, Eternal Sunshine of the Spotless Mind, Mulholland Dr., the wonderful indie Moon, the surprisingly OK Vanilla Sky, the unbelievably horrible Inception, and the almost as unbearable Shutter Island (and I'm a Scorsese devotee). It's a heist movie, which I love; a psychological thriller, which I love; a con movie, which I love; a compromised memory movie, which I love. All rolled into one. There's also a clever subtext about Goya, whose painting "Witches in the Air" is being auctioned and is the target of the heist, being the progenitor of modern art. If this movie is not nominated for best cinematography Oscar, the Academy is out of its mind. I know art and follow the art world, but I could only wish I had the art historical ability to recognize every visual allusion in this film. At one point characters behind three glass screens look like a Francis Bacon triptych, which makes it seem ironic that just last week Bacon's 1969 triptych of Lucien Freud became the most expensive artwork ever sold at auction. Trance is smart, clever, a visual feast accompanied by a throbbing electronic soundtrack by Underworld, Boyle's collaborators on four other films including Trainspotting. Louis Leterrier's Now You See Me is to movies what McMansions are to residential architecture. Look beneath the surface bling at the stick construction armature, and there's no there there. We enter the world of high powered prestidigitation where one upmanship is big and egos are bigger. A mysterious guiding hand using Tarot card invitations brings four rival magicians together who become the Four Horseman. Their stunts involve long distance, computer orchestrated bank heists with a Robin Hood twist, each performance culminating in money fluttering down like confetti into crowds that have been oppressed by the 1%. As the plot lumbers along it grows tentacles that entangle any logic it might have started with. 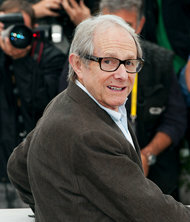 At 76, Ken Loach (above) has followed up his delightful 2009 Looking for Eric with a marvelous little gem of a movie where the 2% of single malt whiskey that evaporates during the aging process, known as "the angels' share," becomes a metaphor for humanitas. Like Kirk Jones's 1998 Waking Ned Devine, The Angels' Share and Looking for Eric recall the tradition of Ealing Studios, especially the 1949 Whiskey Galore! directed by Compton MacKenzie. What these films have in common is that the material object of the quest is merely a vehicle for the quest's larger purpose, which is its power to bring the community together. New dad Robbie finds himself in trouble with the law -- again -- and winds up in a Glasgow community payback program under the guidance of Harry, played by the ever wonderful John Henshaw. Harry has a penchant for fine whiskey and takes his miscreant charges to a tasting, where it turns out Robbie has the gift of a nose. The young people's pursuit ensues and will ultimately bring redemption to them all.